9th Anniversary of Independence, 1928. 15 paisa, rosine.Printed in sheets of 8 comprising two tete-beche panes of 4. Two complete sheets. One with a partial double perf, the other imperf vertically. 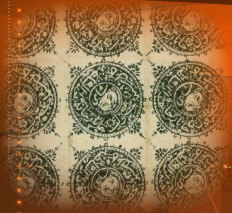 Used on piece, Kabul to Peshawar, 1306 Hoot 10 (=28th February 1928). A pair imperf between, commercially used from Kandahar to Kabul. Sheets can be found cancelled-to-order with the postage due canceller. Here the first sheet has a double perf across the centre, the second is imperf vertically.